Scarfolk's Junior Detonation Task Force was noted for its over-enthusiasm in regard to unattended children. It was known to test a parent's attention by luring them away from their child, beyond the legal 4 metre supervision zone, with the offer of weekend caravanning holidays, expensive kitchenware and ice-creams. The sound of controlled explosions became commonplace in airports, bus stations, libraries, supermarkets and public playgrounds. However, parents could not be held responsible when their children were at school or any other of the town's many infant indoctrination covens. 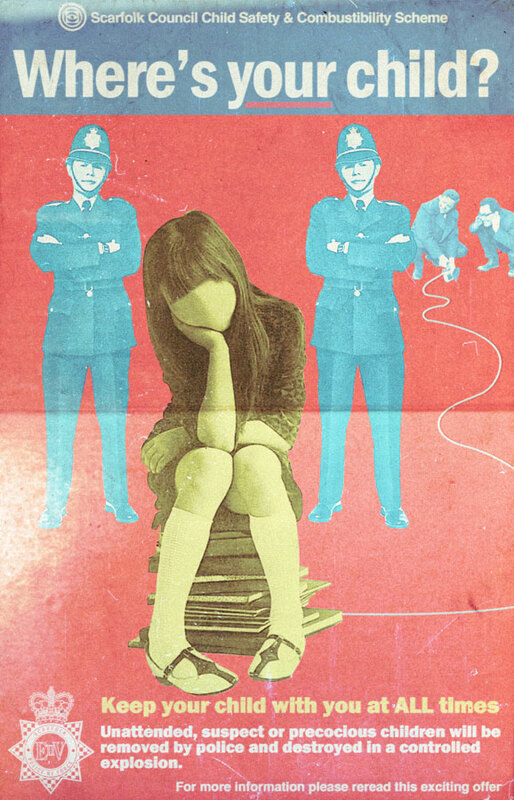 Scarfolk education authority, keen to avoid staff culpability, redefined concepts of supervision and attendance by making the child responsible for its own proximity to its teacher. For example, the education board decreed that a member of staff could not be held accountable if a child daydreamed. Apart from the fact that daydreaming was technically deemed to be truancy, it took a child well beyond the supervision zone, psychologically speaking, and staff could not be expected to go into a trance every time a child needed to be retrieved from its reverie. This form of mental agility was particularly taxing for gym teachers. Yet children found it hard not to daydream, largely due to the plethora of medication they were expected to imbibe daily. Children all over Scarfolk eventually became disgruntled about the frequent detonations which continually disrupted classes, and they trained a group of pre-school mediums to wander the psychic plane alerting absent-minded children before they were spotted by the Junior Detonation Task Force. 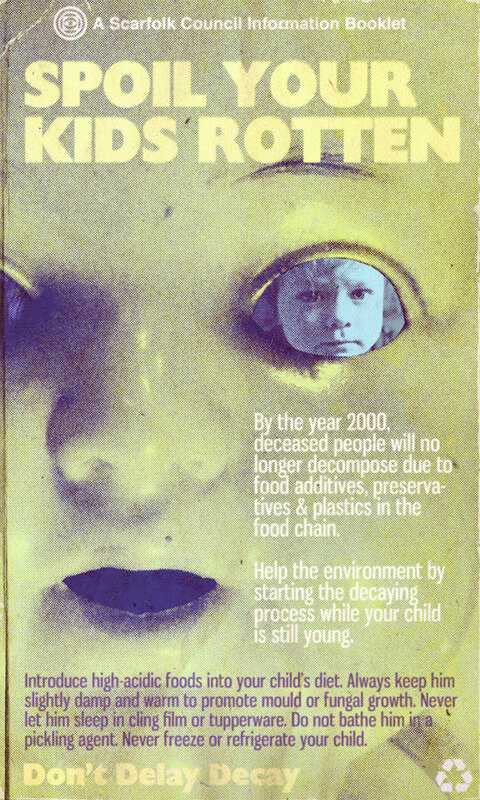 Many charities in 1970s Scarfolk were actually illegal fronts for corporate and political organisations. Rising costs meant that even the once reliable trading of unsatisfactory citizens was not enough to feed expanding budgets. Additional revenue sources had to be found. 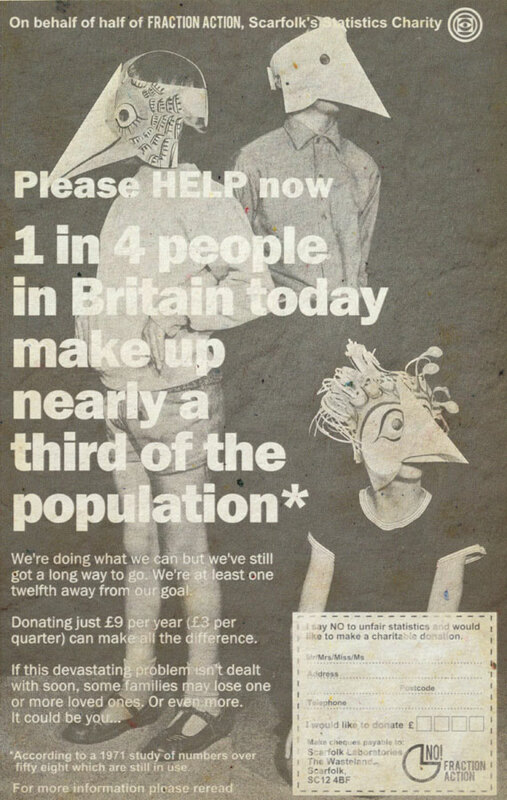 The charity 'Fraction Action' (see newspaper ad above) was the brainchild of Sir John Elegy who was not only a member of Scarfolk council but also had shares in Scarfolk Laboratories, a company owned by the Cavalier Pharmaceutical company (see 'Discovering Scarfolk' for more details). To be fair, 'Fraction Action' did redirect some of the donations it received: 1.2p out of every £100,000 was put in a jar in the Scarfolk Labs canteen as a contribution to the dinner ladies' Christmas lunch. The remainder of the donations was consumed by 'administration' (i.e., administering recreational medication), 'running costs' (i.e., running to ground people who had been farm-bred specifically for hunting) and 'over heads' (i.e., literally expensive flights abroad). The 'Fraction Action' campaign ads also efficiently foreshadowed and justified the council's later random purging of citizens, which was necessary if Scarfolk Labs was to continue its crucial genetic experiments into human/furniture hybridisation, a noted example of which was the Hair Chair. 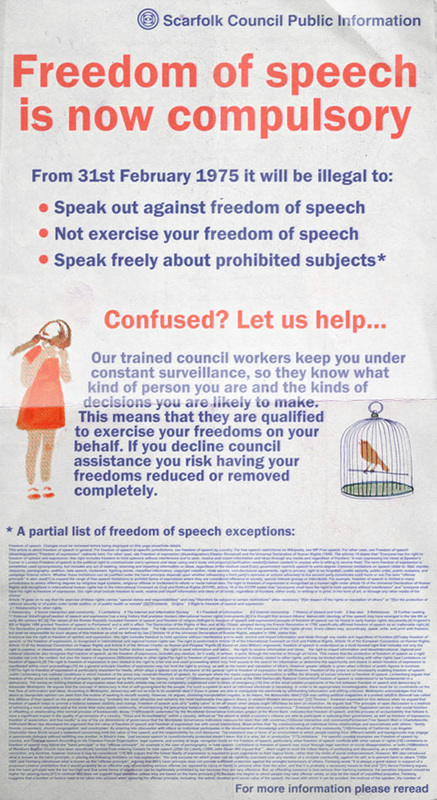 While freedom of speech should, without exception, always be upheld and fought for, it was complicated in 1970s Scarfolk. Take, for example, the case of the multinational New State Corporation, which converted decommissioned army personnel with psychological problems into soft toys that taught feral and left-wing children about Jesus. When two employees, Ed Manning and Julien Snowden exercised their freedom of speech to expose the company's illegal use of black magick (and candy floss) in the conversion process they soon found themselves in prison awaiting trial. The problem was that there were so many (and sometimes contradictory) exceptions to freedom of speech that it was only practically possible to exercise it if you were a) very wealthy or b) the government had a vested political interest in what you were saying and were willing to endorse you, or c) you said what you had to say, then hid where no one could find you. 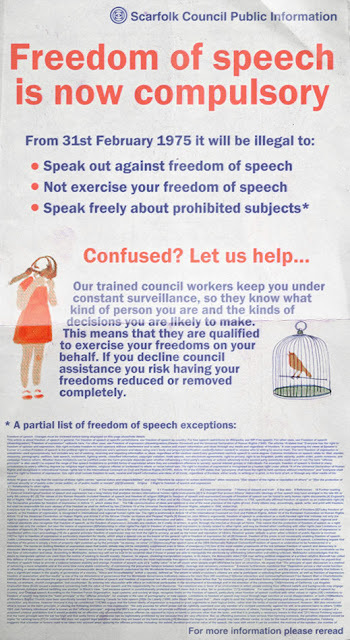 "Everyone verbally exercising their freedom of speech at the same time not only contravenes a noise pollution bylaw, but also makes it difficult for our many council stenographers who are trying to illicitly record what everyone is saying". In July 1973, accused murderer Karen Skrayp walked free when the forensic evidence against her was found to be inconclusive. Skrayp had been arrested when her alleged victim's hairs were found stuck to her sharpened dentures. Though the hairs clearly belonged to the victim, forensic tests demonstrated that they shared most of their genetic make-up with polyethylene bottles used for carbonated drinks such as 7-UP, E-Cola and Fizzy Gravy. A murder conviction could not be brought against Skrayp who got off with a fine for the lesser crime of littering. The case highlighted a serious environmental problem. Due to the abundance of food preservatives and plastics entering the food chain, people were slowly turning into potentially indestructible 'living dolls'. Indeed, several exhumations showed that cadavers were not decomposing. Human decay rates were slowing to that of discarded bubble wrap or a Wombles lunch box. Scarfolk Council was the first to suggest that church graveyards and crematoria be converted into mass human recycling centres. It proposed that recently deceased relatives be placed into pork-coloured dustbins to be collected bi-monthly for recycling. Human remains would be rendered into drinking straws, lifelike plastic models of children for barren couples, and religious figurines for the intellectually barren. One man, Jack Powers, became so famous for the particularly high plastic content in his body that when he died he was made into his own series of eponymous action figures. A council booklet published in 1979 (see below) proposed that parents treat their children as early as possible so that by the time they are grown up they are already partially putrefied.